We’d love your help. Let us know what’s wrong with this preview of Lords of Trillium by Hilary Wagner. To ask other readers questions about Lords of Trillium, please sign up. This has been on my TBR list for quite some time as I thoroughly enjoyed the first books in the series. Lords of Trillium did not disappoint me! I was happy to follow Juniper and friends as they struggled to find out what was causing the disappearance to teams of hunters. Their terrifying discoveries in the secret labs of the humans in the city Trillium was frightening, indeed. But more powerful than that, was the message of redemption. Nicely done Ms. Wagner! My name is Billycan, and I've changed since the effects of lab experiments have slowly weakened. Other creatures should still fear me, since I've killed more rats than I can count. However, I don't like the old me, and the Tuscans have told me about the terror of a former major. I've returned to Nightshade to stop her from destroying the peaceful city and murdering my brother and son. However, something else is happening too. I still have nightmares from my time in the Trillium labs, and it seem My name is Billycan, and I've changed since the effects of lab experiments have slowly weakened. Other creatures should still fear me, since I've killed more rats than I can count. However, I don't like the old me, and the Tuscans have told me about the terror of a former major. I've returned to Nightshade to stop her from destroying the peaceful city and murdering my brother and son. However, something else is happening too. I still have nightmares from my time in the Trillium labs, and it seems events are leading me back there. I've learned the scientists wanted my race of rats due to the effects of living above an extinct volcano. They did unspeakable experiments on us that caused the vicious killings in my past. Memories of the lab incense me, but its secrets may lie below the old library. Great ending to the series...…………..or is it the end? Don't know. Lots of action and adventure. 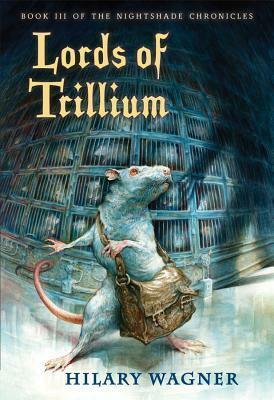 Lords of Trillium begins with the disappearance of rats from Nightshade City. Juniper and Vincent quickly go Topside in order to search for the missing Hunters, hoping to find clues as to whether the dock rats, Humans of Trillium or even Billycan are behind it. Over the past year, the Council has been searching through the books, journals and research papers that were left behind by the scientists for answers to the rats longevity, strength and intelligence. At the same time, Billycan has made h Lords of Trillium begins with the disappearance of rats from Nightshade City. Juniper and Vincent quickly go Topside in order to search for the missing Hunters, hoping to find clues as to whether the dock rats, Humans of Trillium or even Billycan are behind it. Over the past year, the Council has been searching through the books, journals and research papers that were left behind by the scientists for answers to the rats longevity, strength and intelligence. At the same time, Billycan has made his way to Tosca trying to move away from his past and maybe do some good. While there, Billycan learns that someone he knows closely had an army on Tosca and was instrumental in causing the King to go "mad" and is now secretly plotting revenge against Juniper and all of Nightshade. Will Billycan make it back to Trillium in time to help? I won this book in a first reads giveaway, and after hurriedly reading the first two books in the series, I was excited to dive into this one. Great children's fantasy series! Lords of Trillium is almost an "origins" story, but not quite. It explains a lot of the history behind the characters in this series, where they came from, etc. 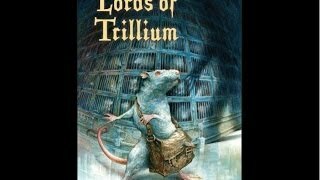 It goes a lot deeper into the relationship between the Trillium humans and the rats and answers a lot of questions I had from the first two books. The only disappoin I won this book in a first reads giveaway, and after hurriedly reading the first two books in the series, I was excited to dive into this one. Great children's fantasy series! The only disappointment for me with this book is that it's the last one in the series. Maybe another will appear? One can only hope. As I mentioned in my review of The White Assassin , redemption is a powerful feature in a novel, and there is an aspect of that in this book as well, although for me it isn't quite as powerful. Still a wonderful story that I enjoyed immensely. This is really the 3rd book in the nightshade cronacles series. Rats have started dissapearing, and the council looks where they have gone. At a wedding, one of the rats, Elvi, was really Hecate, a truly evil rat, who tried to ill a rat, and the children too. Billycan discovered Hecate's secret, and he arived just in time to help defeat Hecate. Another rat has one missing, and the council discovers that the missing rats were in cages in a secret lab. The rats helped the rats in the cages escape, This is really the 3rd book in the nightshade cronacles series. Rats have started dissapearing, and the council looks where they have gone. At a wedding, one of the rats, Elvi, was really Hecate, a truly evil rat, who tried to ill a rat, and the children too. Billycan discovered Hecate's secret, and he arived just in time to help defeat Hecate. The book has two stories within it, first the Nightshade rats will find out who the traitor is in their mist and second they have to find out why the Hunters have vanish and not return. Woven into the whole book is the character Billycan as he found himself in the beginning of the book as a leader of the Tosca until he founds out the Nightshade rats might need his help. Throughout the story we learn more of the history of the rats and who is the rest of the family of Billycan. Let's just say th The book has two stories within it, first the Nightshade rats will find out who the traitor is in their mist and second they have to find out why the Hunters have vanish and not return. Woven into the whole book is the character Billycan as he found himself in the beginning of the book as a leader of the Tosca until he founds out the Nightshade rats might need his help. Let's just say that at the end of the book, all the past problems are gone (unless they get out). I really didn't want to finish this book, because it also meant finishing the trilogy. I enjoyed it so much! I loved all the characters. Juniper, Vincent, the earthworms, Clover, and of course Billycan... He was such a great character, and his development felt real and even made you sympathize with him. The ending was perfect. I will definetely read these books again. Totally recommended. I’m not a huge fan of animal stories, but I enjoy Hilary’s writing and this is a wonderful series. It’s been awhile since I read book 2, so I became reacquainted with these characters. In this book 3, the community of rodents has to deal with missing rats. The atmosphere is dark and haunting as we follow these missing rats to where many end up—in labs run by humans! Will they be saved? There’s a lot of emotion, action, and intrigue in this book. Good. The ending I thought was a bit overmuch. All is well in Nightshade City, or so it seems. Hunting parties of rats are going missing! Sweet Elvi seems to be up to something. Billycan has finally found a place where he feels good, a new home in Tosca, but his past troubles him. Did Juniper hear his warning about Elvi? How do the rats of Tosca know about her? And is she really Elvi at all? Follow along as Billycan learns more about himself, as Juniper learns more about his brother Billycan, and all the rats of Nightshade City learn more ab All is well in Nightshade City, or so it seems. Hunting parties of rats are going missing! Sweet Elvi seems to be up to something. Billycan has finally found a place where he feels good, a new home in Tosca, but his past troubles him. Did Juniper hear his warning about Elvi? How do the rats of Tosca know about her? And is she really Elvi at all? Follow along as Billycan learns more about himself, as Juniper learns more about his brother Billycan, and all the rats of Nightshade City learn more about themselves. Another stunning book in the Nightshade City Trilogy! Let down that I've finished the set because I love reading about these characters so much. Sad to see it end. A wonderful book that was difficult to put down!